However, just how the War of 1812 should be commemorated, and what this war actually meant to Canadian history, is being actively contended in the pages of the Globe and Mail. According to the Department of Canadian Heritage, the War of 1812 was a pivotal event that ultimately shaped the nation that became Canada. Many point to the “happy aftermath” of the war: the 200 years of peace with the United States, as well as the Rush-Bagot agreement of 1817 that limited military activities on the Great Lakes. Others argue that the war “was among the dumbest ever fought,” and charge the Harper Government with attempting to use the bicentennial as “contemporary nationalistic propaganda.” Alan Taylor’s recent book, The Civil War of 1812, also muddies the waters concerning why the war was fought and who was fighting it. Taylor argues that “national” identities and borders were fluid, and the war shouldn’t be seen as simply an American invasion repelled by the British military and Canadian militia. While the argument rages about how and why the War of 1812 should be commemorated, there remains a serious silence in the national dialogue concerning the role of the First Nations allies in the war. As detailed in Carl Benn’s The Iroquois in the War of 1812, “the War of 1812 was a critical event in Iroquois history.” The Iroquois allies were pivotal to British victories in major battles such as Queenston Heights, Beaver Dams, the blockade of Fort George and Crysler’s Farm. Benn concludes that the outcome of the war, the successful defence of British territory, “could not have been achieved without aboriginal support of the king’s cause.” Taylor reiterates this point stating by “intimidating American troops, the warriors had done more to foil the invaders than had the Canadian militia, but a postwar myth glorified the militia and degraded the Indians.” Like they had during the American Revolution, warriors from the Six Nations allied themselves to the British cause. John “Smoke” Johnson, grand-father of the poet Pauline Johnson, was one of these Six Nations warriors. He left the Grand River at 21 years old to join Isaac Brock. Johnson fought at Queenston Heights, Lundy’s Lane and Stoney Creek. He also claimed to have set the fire that burned Buffalo in December 1813. 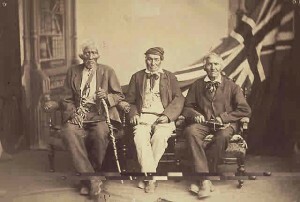 The iconic photograph taken in 1886 shows ninety-three year old John “Smoke” Johnson (right) with two other Six Nations veterans of the War of 1812, Jacob Warner (left) and John Tutlee (centre). While Canadians today view the War of 1812 as a victory for Canada, and two hundred years of peace with the Americans, there was far less of a “happy aftermath” for Britain’s Six Nations allies. During the war the Six Nations found themselves fighting against their Iroquois kin at battles like Chippawa. Following the war, despite promises from the Indian Department not to interfere with their affairs, the Six Nations of the Grand River found their territory increasingly threatened by white squatters, and their finances mismanaged by white officials. In the 1840s the Six Nations of the Grand River were forced to abandon the majority of their territory and were moved into a small reserve along the Grand River. The two hundred years that followed the War of 1812 was not a time of peace and prosperity for the Six Nations, but marked the end of their independence as allies of Britain, and decline in their sovereignty and territory. While the Canadian government treats the War of 1812 as a defining moment in Canadian history that led to the creation of the nation of Canada, for the Six Nations of the Grand River the war has very different meaning. The Woodland Cultural Centre in Brantford is planning an exhibit to raise awareness about the role of the Six Nations Confederacy in the War of 1812. With all the attention that is being focused in Canada on the bicentennial of the war, hopefully some people will take the time to look beyond the militaristic and nationalistic propaganda to learn more about the important role that Britain’s allies, the Six Nations and other First Nations, played in repelling the American invasion.